Click the image below for an interactive map allowing you to visit many of the law enforcement offices examined for this report. If you've been subject to an asset-forfeiture proceeding and are willing to share your story, please contact us at cronkitenews@asu.edu. Arizona law enforcement agencies have spent more than $57 million since 2008 through a federal program granting money and other property seized from those suspected of crimes, a Cronkite News review found. The beneficiaries range from the Phoenix Police Department, which spent more than $3.8 million on computers and communication equipment, to the Sierra Vista Police Department, which put nearly $40,000 toward a $277,000 LENCO BearCat Tactical Vehicle the city wouldn’t pay for in its budget. Some agencies spent these funds in ways not directly related to policing, including the Chandler Police Department, which donated $61,500 to a national law enforcement charity, and the Pinal County Sheriff’s Office, which spent nearly $110,000 upgrading its fitness center. The money comes from the federal Equitable Sharing Program, which allows state and local agencies that are involved in federal investigations to seize money, vehicles, homes and other assets from those suspected of being involved in criminal activity. Created in the 1980s as a tool in the so-called war on drugs, the program’s foundation is civil asset forfeiture, a process through which assets can be seized without the owners being brought to trial. To get seized property back, owners must file “valid, timely” claims and prove their property wasn’t involved in a crime; otherwise, it’s forfeited to the agencies involved. Cronkite News reviewed hundreds of documents describing the purchases that were filed annually from fiscal 2008 to fiscal 2013 with the Department of Justice and the Department of Treasury. Those available for fiscal 2014 were also included. Most purchases detailed in the reports were for expenditures commonly associated with law enforcement, including vehicles, weapons, uniforms, computers and buildings. But the records are far from detailed when it comes to many expenditures, allowing departments to simply report amounts spent within broad categories. These include: communications and computers, accounting for $13.6 million of the total statewide; buildings and improvements ($6.1 million); travel and training ($2 million); and informants, “buy money” and rewards ($2 million). Even the itemized expenditures required in a category called “other law enforcement expenses” are often ambiguous. The Counter Narcotics Alliance, a Tucson-area drug task force, reported spending $654,000 on “personal services” in 2009, with no further details listed. Officials connected with the task force didn’t explain this expenditure despite repeated requests for comment. 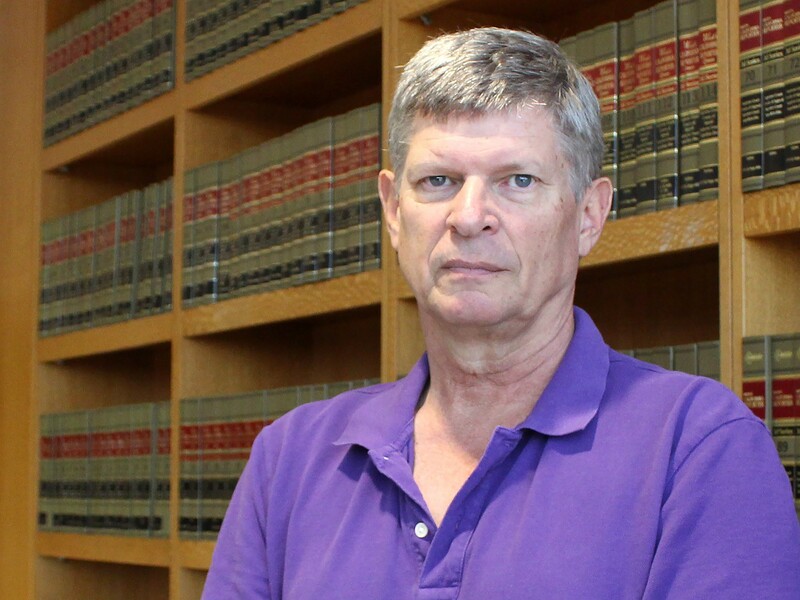 Dan Barr, a media lawyer with Perkins Coie who works with the Arizona First Amendment Coalition, said a lack of transparency damages public trust in law enforcement agencies. At the Arizona Department of Public Safety, which spent $9.1 million from the federal program from 2008-2013, Budget Officer Philip Case said that without money from seizures the agency would struggle to fund specialized units like its SWAT, computer forensic and bomb teams because the Legislature doesn’t explicitly pay for them. “They just give you a lump-sum budget, and it’s difficult to say what’s in it and what’s not,” he said. The money from the federal program represents only part of the total assets seized in the state, as Arizona’s own forfeiture program allows agencies to spend even more freely. 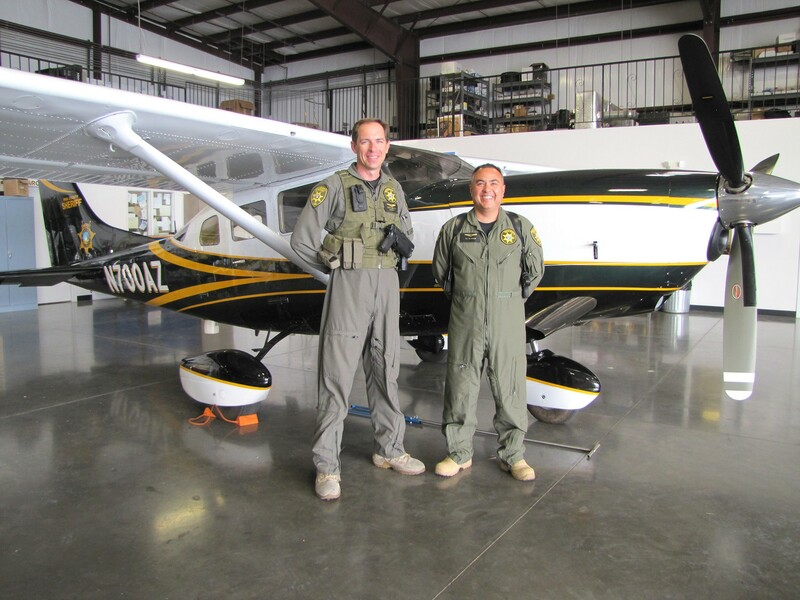 Administrators from the Pima County Sheriff’s Department, which put more than $1 million in federal forfeiture funds toward two 1999 Cessna 206H airplanes in 2014, said they depend on money from seizures from both the federal and state programs to operate at full capacity. In all, the department received $1.4 million from the federal program during the period reviewed. Of the $1.4 million it received from the federal program during the period reviewed, the Oro Valley Police Department spent $565,000 on communications and computers and $45,500 on a lease payment for a new motorcycle fleet. Civil forfeiture has been a crucial tool in helping the department combat drug trafficking, said Kara Riley, Oro Valley police spokeswoman. The Washington Post reported last year on the Equitable Sharing Program, detailing aggressive police practices by some participating agencies. In response, Attorney General Eric Holder announced new requirements for the program in January, including toughening the criteria for federal involvement in seizures and requiring that law enforcement agencies have either ongoing criminal investigations or warrants to seize property. An opponent of police seizures said that Arizona’s forfeiture laws, which he calls too lenient, will continue to pose a threat to civil liberties despite the changes made at the federal level. “By injecting a profit incentive into law enforcement, you risk shifting the priorities away from the fair and impartial administration of justice and toward the pursuit of profit,” said Tim Keller, an attorney with the Institute for Justice’s Arizona State Office who co-authored a report on the state’s forfeiture laws. Representatives of law enforcement agencies told Cronkite News they use money from seized assets to buy equipment and for other purposes essential to protecting the public. Officials at the Pima County Sheriff’s Department pointed to the two Cessnas, which cost more than $1 million each. “If (asset forfeiture) didn’t exist, we probably wouldn’t have a fleet to be able to do aerial operations,” said Paul Wilson, chief of the agency’s Investigations Bureau. The planes are used for many purposes, he said, including supporting deputies on night missions and for extraditions. The money the agency receives in its budget is simply not enough to enforce the law effectively, Wilson said. “If those funds went away, either dollars have to come in to be able to support the continuation of programs or equipment or those things end up dying on the vine and you don’t have the tools you need to really do an effective job,” he said. Agencies aren’t allowed to “supplant” or replace their budgets with sharing funds. However, some officials said that it’s hard to draw the line between adding to their budgets with sharing funds, which is permitted under the program, and replacing their budgets. For example, he said, the department’s computer forensic unit, which isn’t explicitly funded by the state, relies almost exclusively on forfeiture money. “In statute you won’t see anywhere that says, ‘DPS shall have a computer forensics unit,’ but with the proliferation of technology local agencies that we assist need expert computer forensic help,” Case said. Some officials said that with their agencies’ budgets being cut yearly, these funds have become an important source of revenue. 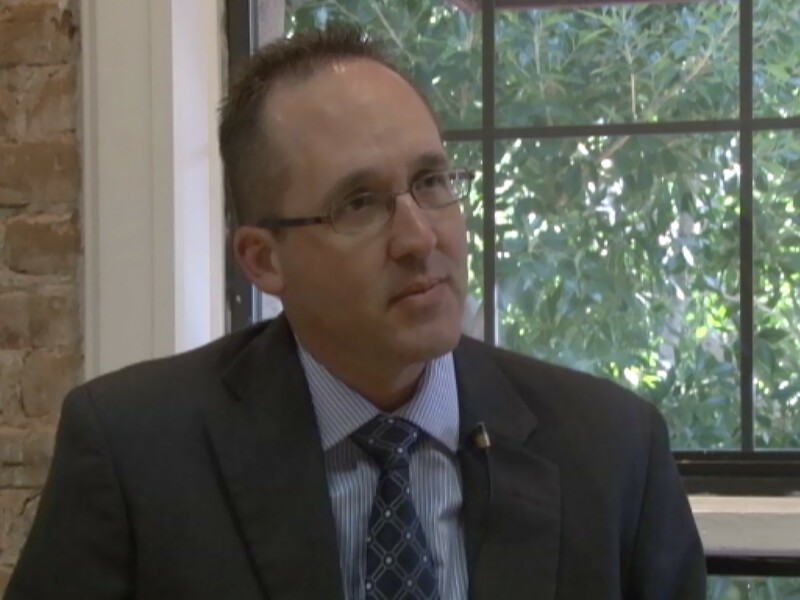 Wilson said the Pima County Sheriff’s Department would be strapped for funding if forfeiture funds were to decrease or disappear. Arizona also has multiple task forces, made up of several police departments, that are primarily funded by money from asset forfeitures. One of these is the Mohave Area General Narcotics Enforcement Team, or MAGNET, which is headed by the Kingman Police Department. MAGNET recently built a $425,000 facility, using $300,000 of federal forfeiture money, at a location officials declined to disclose. For task forces like MAGNET, seizure money can sometimes be used to pay parts of officers’ salaries. 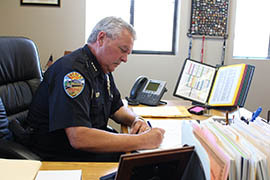 “Without (forfeiture) funds, because of match monies and so on that we have to have, you would probably see the majority of your task forces would fold,” said Robert DeVries, Kingman police chief. Some officials said their agencies used forfeiture money rather than their traditional budgets for expenses that came up unexpectedly or for items that were too costly to be included in their funding requests. 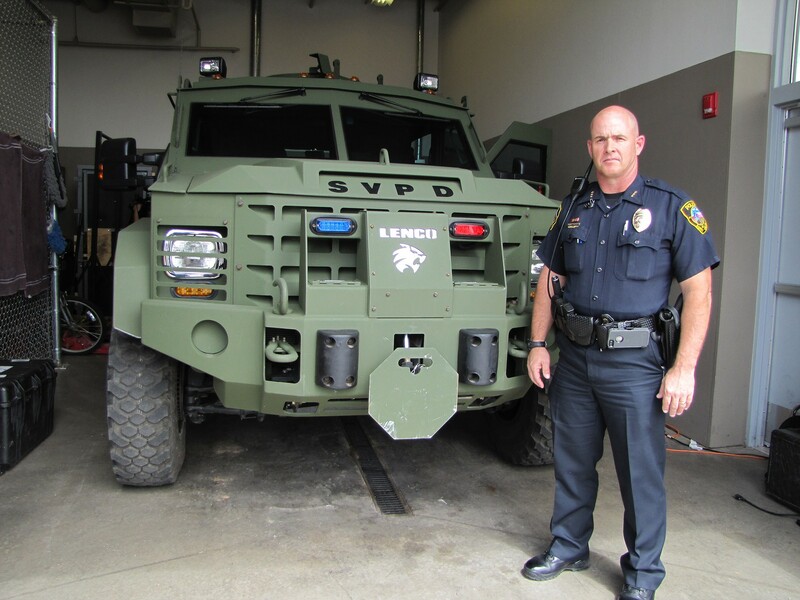 Adam Thrasher, deputy chief of the Sierra Vista Police Department, said his department used forfeiture funds for the BearCat because the city declined to supply money for a new armored vehicle in the budget. Some agencies listed expenditures not obviously associated with policing. After one of its police officers was killed in the line of duty in 2010, the Chandler Police Department donated $61,500 of federal forfeiture money to the National Law Enforcement Officers Memorial Fund, a nonprofit that established a memorial in Washington, D.C., and is raising money to open a museum. “Our chief at the time, she felt that it was very fitting to use funds that criminal organizations used to further their criminal enterprise that we legally seized and use those to honor the men and women that paid the ultimate sacrifice fighting those same criminals,” said Seth Tyler, a Chandler police spokesman. Other agencies spent money from forfeited assets on community outreach programs. The Oro Valley Police Department put $5,100 toward an Explorer troop for youths considering careers in law enforcement. “It teaches about the community, and it also requires them to give back,” said Riley, the department spokeswoman. Some spent forfeiture money on awards. The Surprise Police Department, for example, spent $558 on awards in 2012. Officials at some agencies declined to explain or didn’t respond to queries about purchases not obviously related to law enforcement. Both the South Tucson Police Department, which reported spending nearly $8,000 on office cleaning in 2011, and the Marana Police Department, which reported spending nearly $13,000 on furniture in 2013, didn’t respond to multiple requests for comment. The Pinal County Sheriff’s Office spent nearly $110,000 upgrading its fitness center. While the office refused to grant an interview about these expenses, spokesman Jim Knupp said by email that they fell within the program’s guidelines because the fitness gear is considered law enforcement equipment. Tim Keller, the Institute for Justice attorney, said that because Arizona police agencies have come to rely on forfeiture funds to buy what they otherwise can’t, asset forfeiture programs create an incentive to make seizures. “Police and prosecutors should not be able to profit from their law enforcement activities,” he said. But officials interviewed by Cronkite News said oversight keeps potential abuses in check. The federal program requires agencies to complete an audit if they spend more than $500,000. Officials at some agencies said they submit proposed forfeiture expenditures to superiors, including boards of supervisors, mayors and the Arizona Attorney General’s Office. In the past, law enforcement agencies were only required to report their forfeiture spending to the federal government and the Arizona Criminal Justice Commission. But legislation signed March 23 by Gov. Doug Ducey will require local departments to provide quarterly reports to county or city governments. The bill’s sponsor, Sen. Sylvia Allen, R-Snowflake, said at a House hearing in February that the reports’ current location on the ACJC website is hard to find and that the change will put them on the agendas of local governments. “There can be transparency and an easier way for the public to know about this issue and what’s happening in their local jurisdictions and to know about these forfeitures and seizures, how that money’s being used and where it goes,” she said. 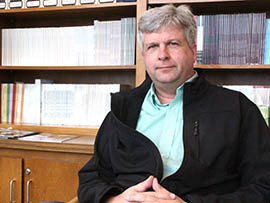 Dave Cuillier, freedom of information chair for the Society of Professional Journalists and director of the University of Arizona School of Journalism, said the merits of the program are impossible to judge when so much information isn’t available to the public. While the documents filed with the federal government provide a glimpse into agencies’ general expenditures, it is impossible to know their specific purchases without asking them directly. Of the 21 local and state agencies Cronkite News contacted, 15 responded, and only seven granted in-person interviews. Some agencies either refused to comment or didn’t respond. Others, including the Phoenix and Scottsdale police departments, refused to answer specific questions related to expenditures. Phoenix police spokesman Vincent Lewis said by email that the types of purchases within each category “may be self-evident” and that releasing itemized lists required public records requests, but he said even those documents might not disclose the full extent of the purchases. “In the course of investigations there is often need to purchase items, rent space, repair vehicles, and other times there are expenses that will remain clandestine so as not to compromise the investigation or reveal confidential information or to protect identities,” he wrote. Scottsdale Police Department spokesman Kevin Watts said in an email that the department couldn’t provide details on the $2 million spent on “buildings and improvements” in 2013 and the majority of the nearly $730,000 spent on “electronic surveillance,” but he said GPS trackers would fall under that category. Watts did say that the $160,000 spent on weapons in 2009 went toward 302 stun guns and 30 protective vests. Officials at most agencies that granted interviews said they had little to no problem with the notion of being more transparent about expenditures but said that they simply aren’t required to do so in the forms. Case, the DPS budget director, said reporting more would take more time and manpower but in general wouldn’t compromise officer safety. Barr, the media lawyer, said regardless of why agencies don’t disclose more about their expenditures, there isn’t adequate information on the forms. “It doesn’t provide the needed information to members of the public – and frankly to the government itself to evaluate its own governmental agencies,” he said. Cuillier said the money belongs to the public and therefore needs to be fully accounted for. “Any penny that is in the grubbies of the government agency, of a public agency, our agency, we’re entitled to see where that penny goes,” he said. Even with the new restrictions on the federal Equitable Sharing Program, officials interviewed by Cronkite News said their agencies’ forfeiture funds wouldn’t be significantly affected because they rely on the state’s forfeiture program for the most of the money they receive from seized assets. In fiscal 2013, agencies received about $6.7 million from the federal asset forfeiture program, according to the documents reviewed by Cronkite News. They received about $71 million from the state program that year, according to reports filed with the Arizona Criminal Justice Commission. 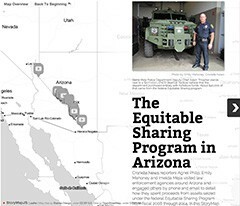 Arizona’s program doesn’t require cooperation with a federal agency and is less restrictive than Equitable Sharing. Unlike the federal program, state forfeiture funds can be used to pay officers’ salaries, according to the report Keller co-wrote. “Arizona’s civil forfeiture laws are so generous, police and prosecutors don’t need to turn to the federal sharing program in order to keep the proceeds of the property they have confiscated and seized,” Keller said. The reports compiled by the Arizona Criminal Justice Commission don’t have itemized lists, which Keller said makes it even harder to determine what law enforcement agencies are buying with the money. “What we do know is that over the last 10 years or so there has been a steady increase in the total amount of dollars forfeited under Arizona law, which isn’t surprising because there is a direct profit incentive for police and prosecutors to seize property and forfeit it,” he said. 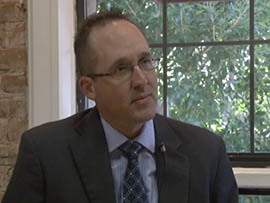 Keller said that while he understands that police face budget challenges, bridging the gap with forfeiture funds presents too many opportunities for corruption. EDITOR’S NOTE: Cronkite News reporter Imelda Mejia contributed to this report. Hover over the buttons on the document and read pop-up notes detailing key items on the page. A special report examines how law enforcement agencies spend the millions they receive from assets seized under a federal program. An advocate says the money encourages police to seize assets. The Sierra Vista Police Department put nearly $40,000 of asset forfeiture money from a federal program toward this $277,000 LENCO BearCat Tactical Vehicle. Deputy Chief Adam Thrasher said the budget approved by the city wouldn’t pay for an armored vehicle. 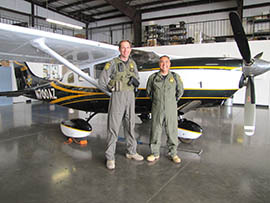 Chris Janes, left, and Jim Grisham work with two Cessnas the Pima County Sheriff’s Department purchased with money from asset forfeitures. 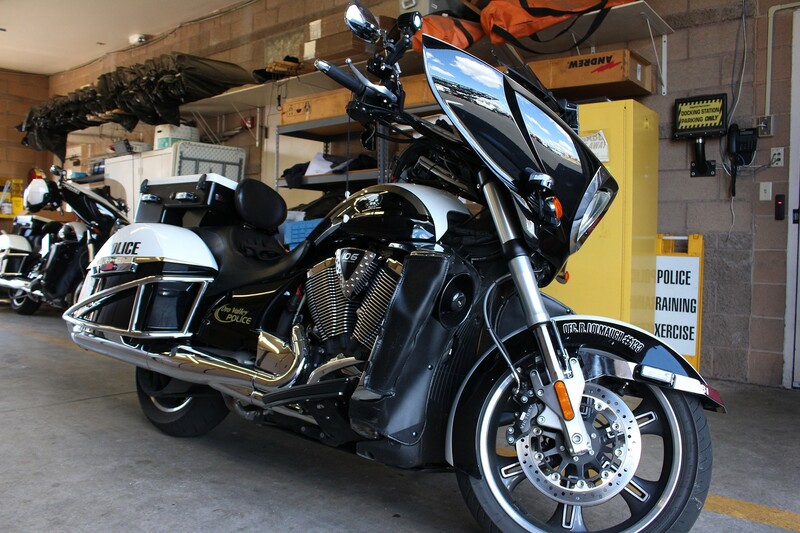 This motorcycle is part of a fleet for which the Oro Valley Police Department put $45,500 of federal asset forfeiture money toward a lease payment. 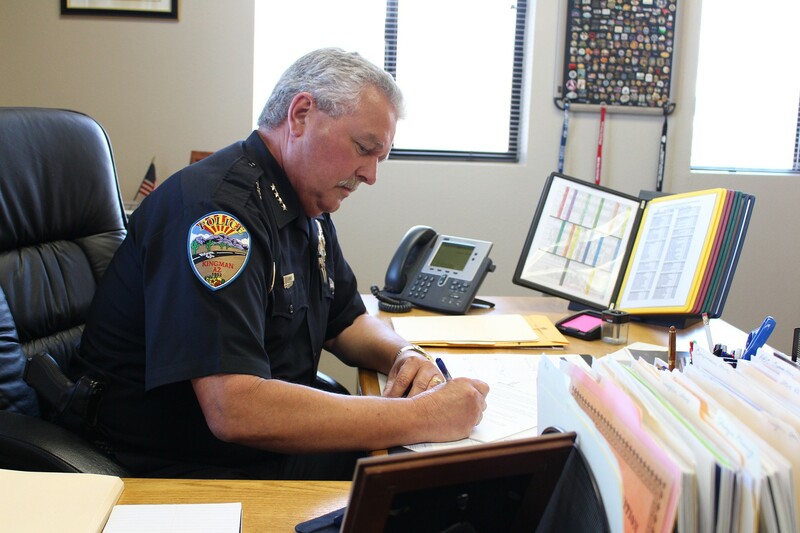 Kingman Police Chief Robert DeVries says money from asset forfeitures is essential for task forces such as Mohave Area General Narcotics Enforcement Team, or MAGNET, which his department heads. Tim Keller, an attorney with the Institute for Justice's Arizona State Office, says Arizona’s asset forfeiture laws, which he calls too lenient, will continue to pose a threat to Arizonans’ civil liberties despite the changes made to a federal program. Dave Cuillier, freedom of information chair for the Society of Professional Journalists and director of the University of Arizona School of Journalism, says the merits of the asset forfeiture program are impossible to judge when so much information is hidden from public view. Dan Barr, a media lawyer with Perkins Coie who works with the Arizona First Amendment Coalition, says secrecy in government programs such as federal asset forfeitures damages public trust.